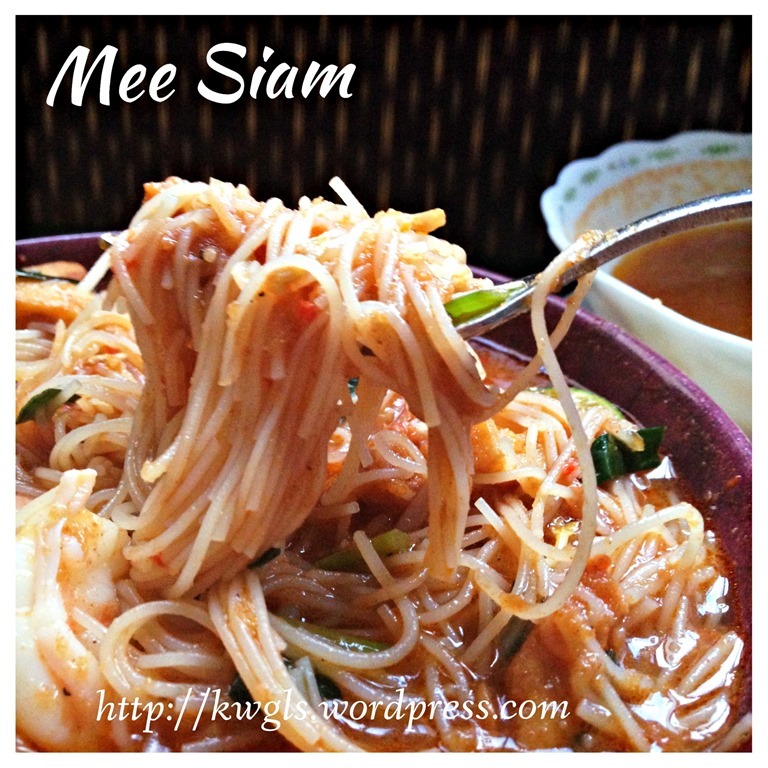 I am unsure if Mee Siam (or literally translated to Siamese Noodles) is related to Siam or the old name of Thailand. 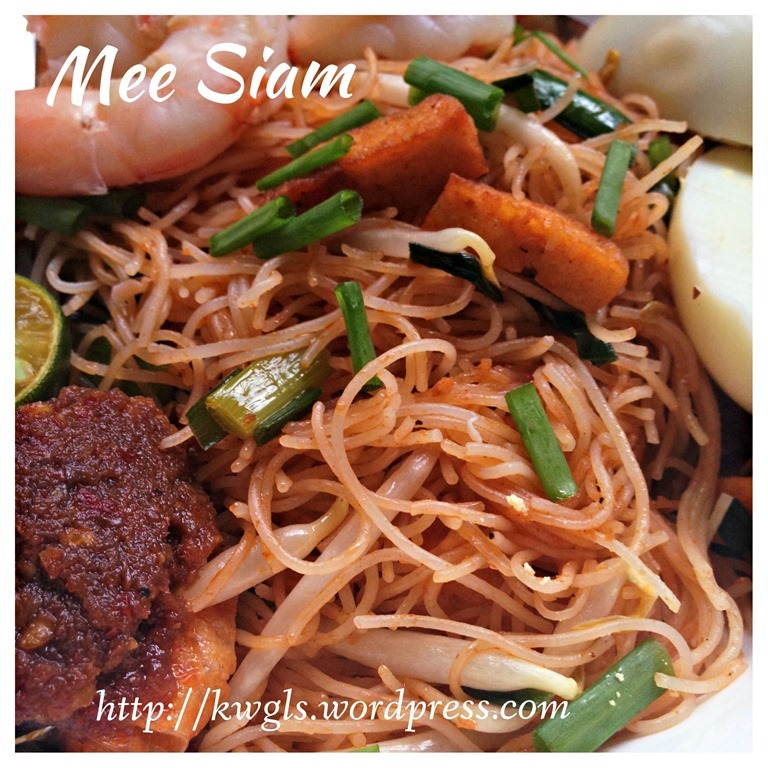 Some will say that it is very similar to a type of noodles called Mee Kati found in Thailand. 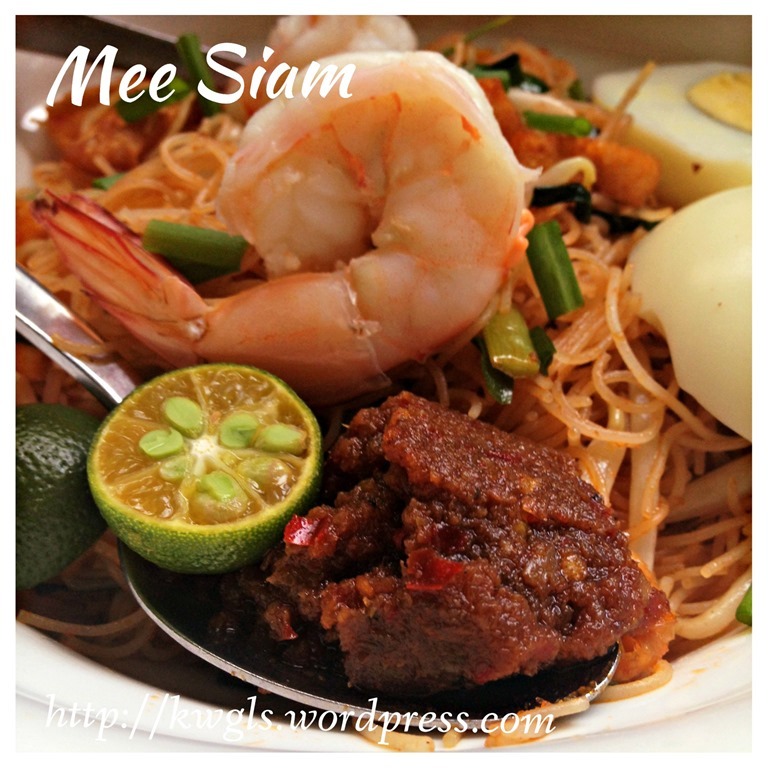 However, there are those who disputed that Mee Siam have nothing to do with Thailand as you can’t get such noodles in Thailand. 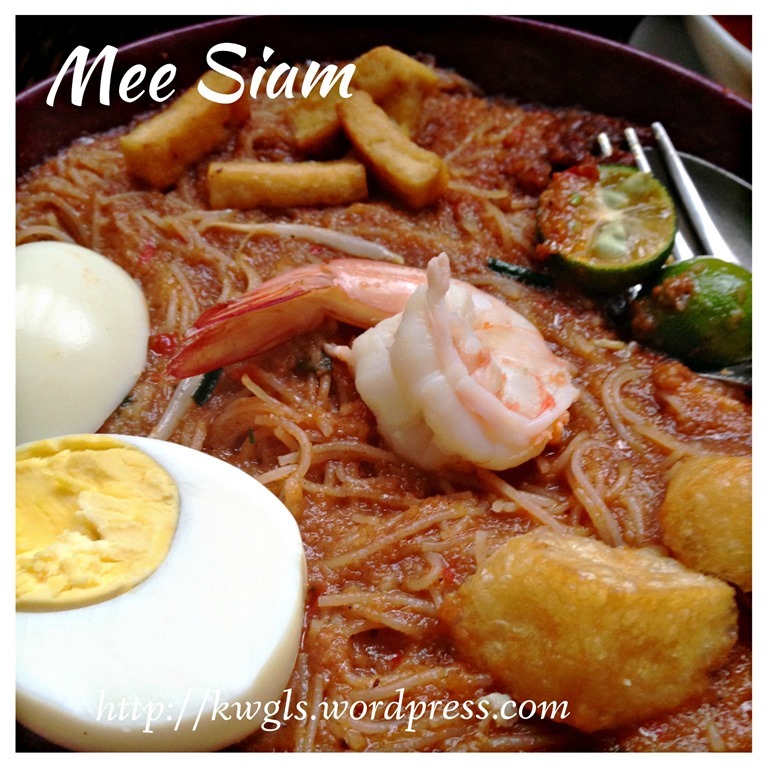 Whatever it is, let’s not dispute about the originality of the noodles but a recipe that is well liked by Singaporeans and particularly West Malaysians. 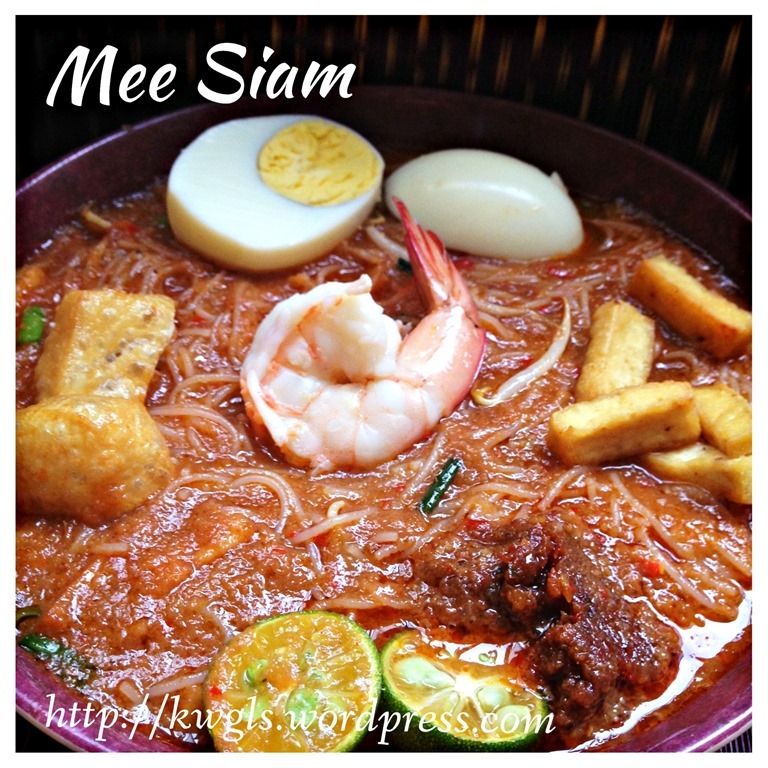 When I posted my Mee Siam images in a Facebook Peranakan Group (Nonya and Baba Clan), it kick start a discussion of what should Nonya Mee Siam be liked? Should it be dry version or soup version. 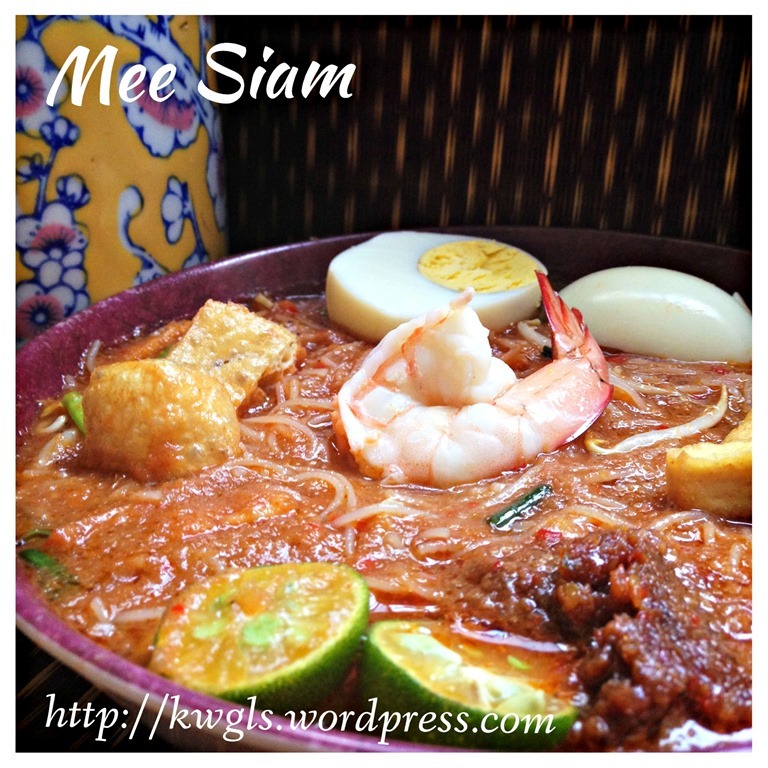 Some claimed that authentic Mee Siam shall be dry version whereas those Peranakan community in Singapore said that it should come with soup. 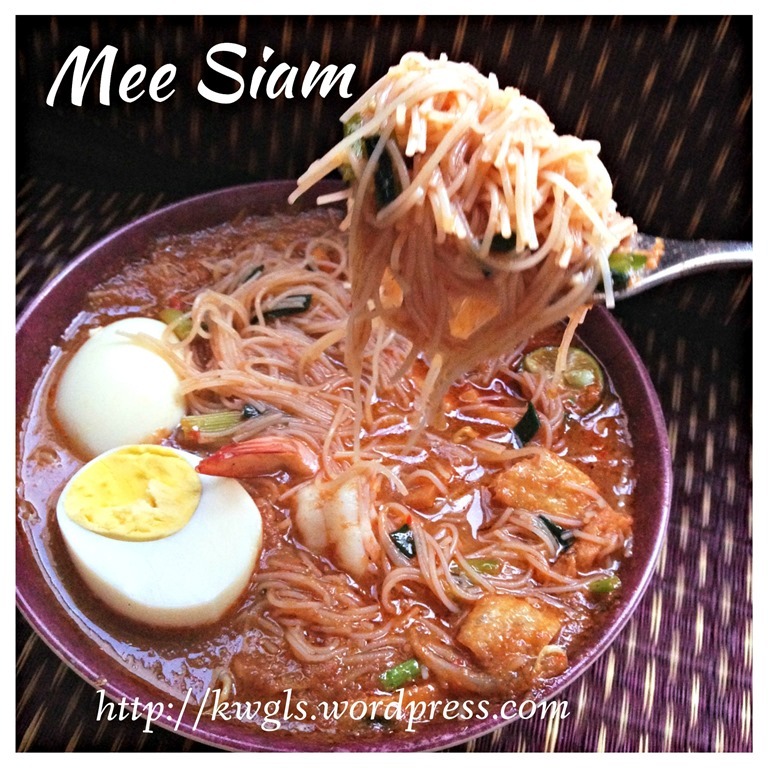 Hmmm, I am unsure who is true but all this while, the Mee Siam that I have tried are soupy version and mostly in Singapore. In fact, I have never try the dry version. Setting this aside again, let’s not dwell into which is authentic but the recipe I am going to share is the soupy version of Mee Siam. 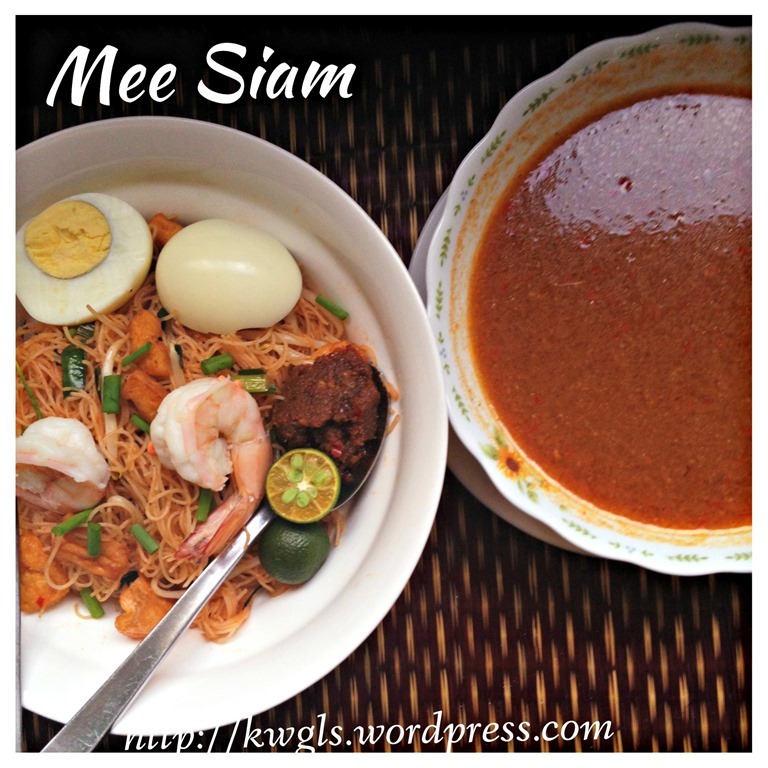 I especially like the gravy of Mee Siam, it is supposed to tangy, sweet and spicy. 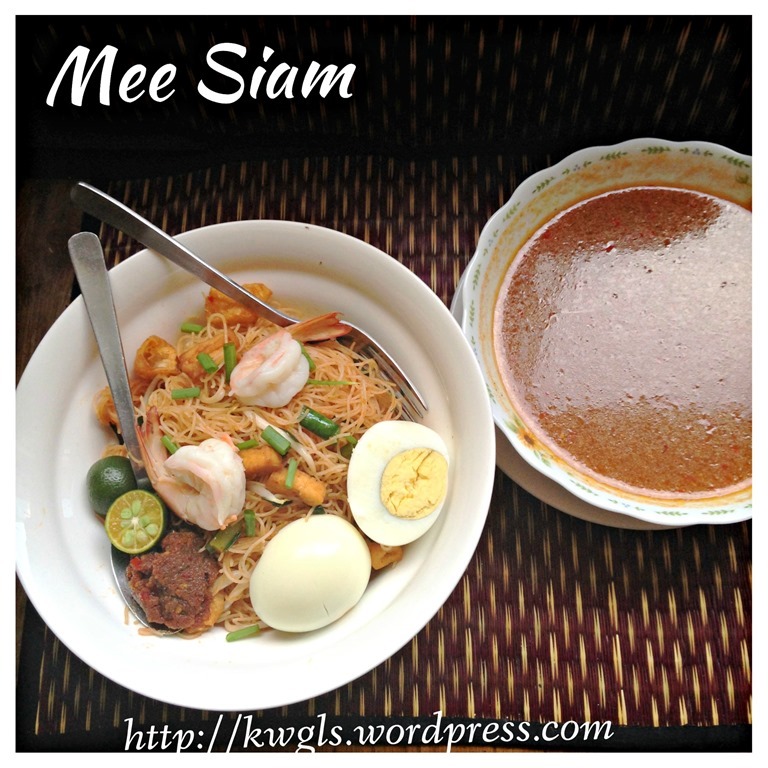 Most friends around me are also assessing the tastiness of a bowl of Mee Siam on that few criteria of the gravy. 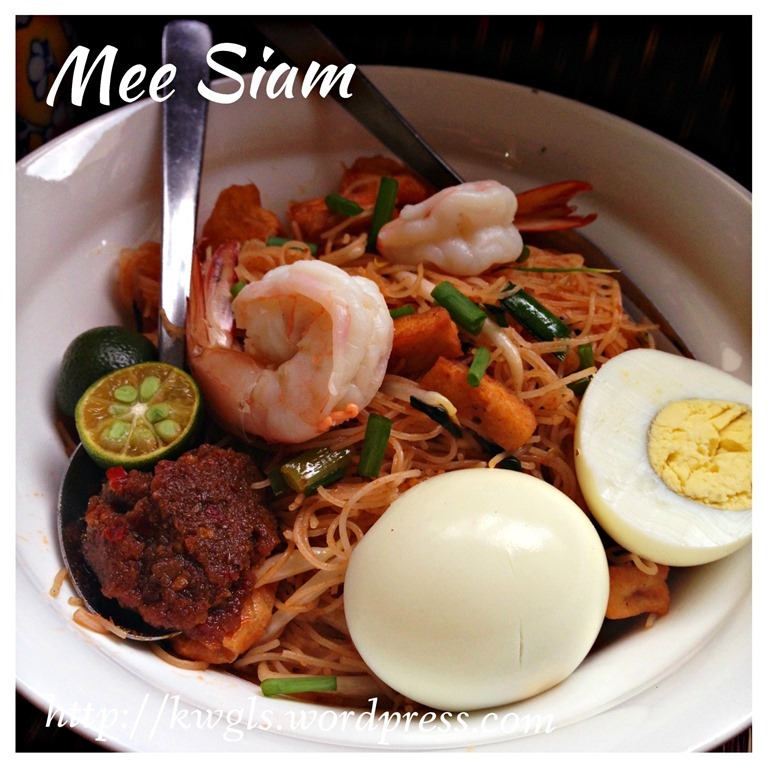 Addition of calamansi juices will heighten the palate and usually a bowl of delicious Mee Siam is not enough for me! Ha-ha. It is very appetising. 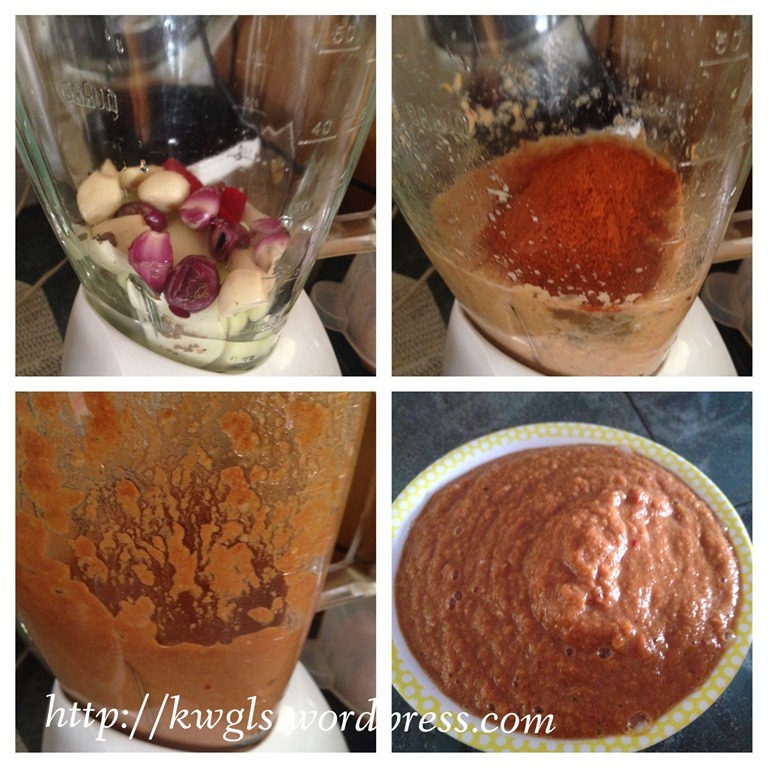 Put all the spice mix or rempah ingredients into a blender and blend until fine. Set aside for later use. Shelled and de-veined the prawns. Keep the shells. 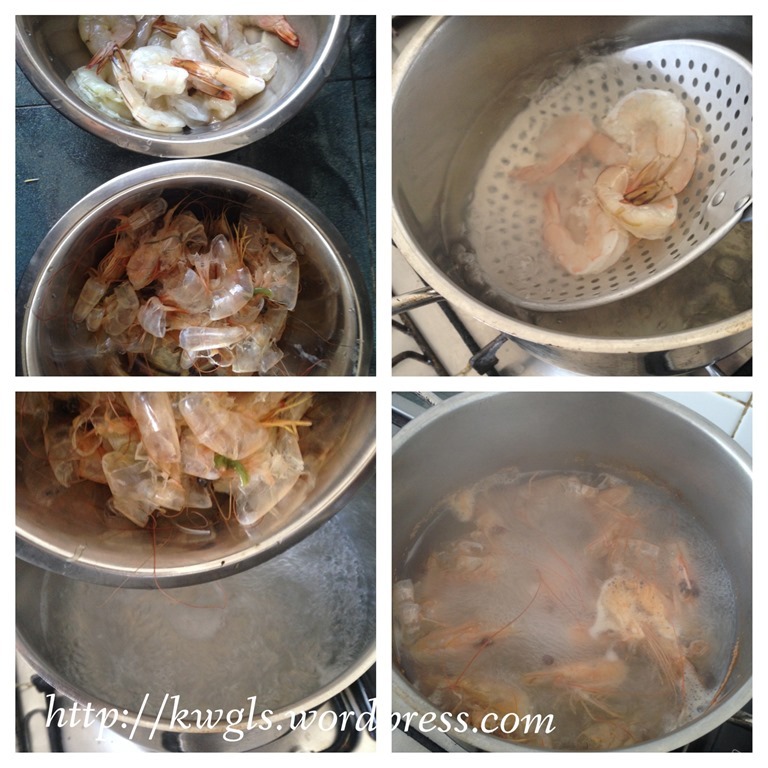 Bring a pot of water (about 5 cups) to boil, blanch the prawns for 2-3 minutes until the prawns curl up and turn whitish. Dish up the prawns and set aside. 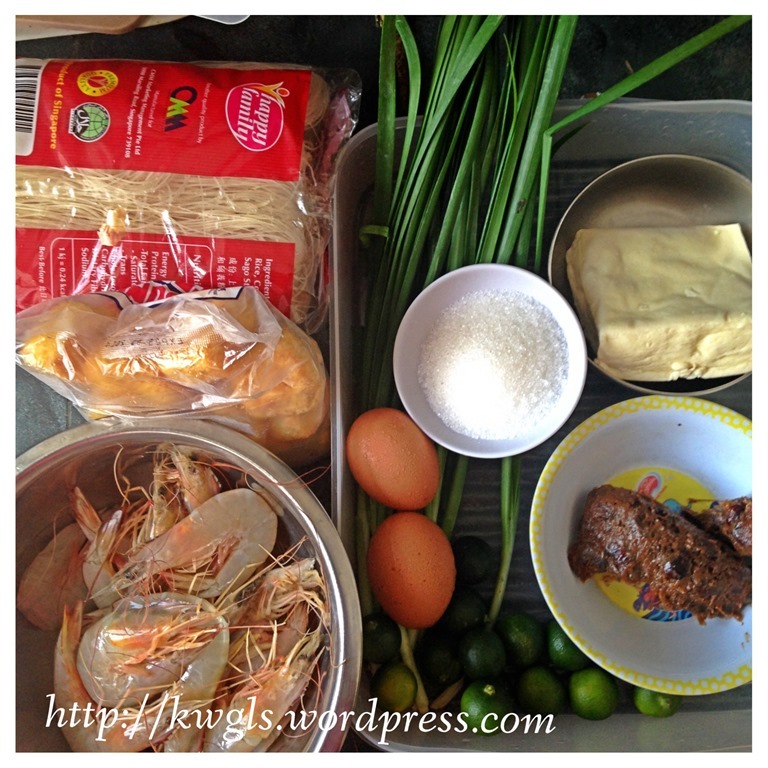 Throw all the prawn shells inside, bring to boil and let it simmer for at least 15-20 minutes. These are the prawn stock to be used for the gravy later. 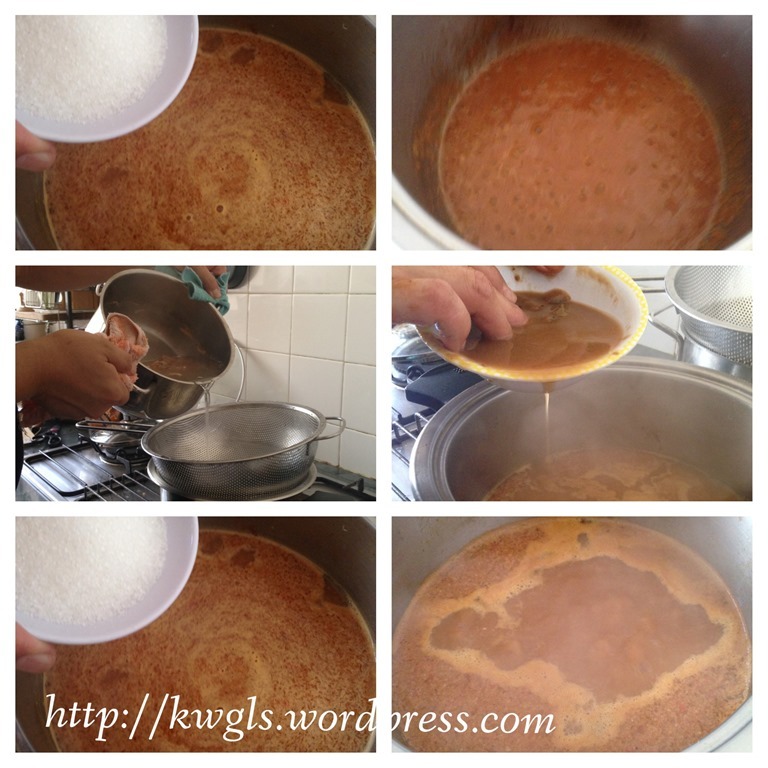 In another pot, heat up some cooking oil, transfer half of the spice mix or rempah and stir fried until the aroma of the spice starts to penetrate the kitchen, sift the prawn stock to the fried rempah and add in the tamarind juice, sugar and salt. Bring to boil and set aside for later assembly. You may want to take some gravy and taste if it suits your taste buds. Otherwise, adjust it at this stage. In a frying pan, add some cooking oil (about 5 tablespoons) and pan fry the taukwa or drier bean curd until golden brown. You can either deep fried this or even air fried this if you want. Set aside for later use. 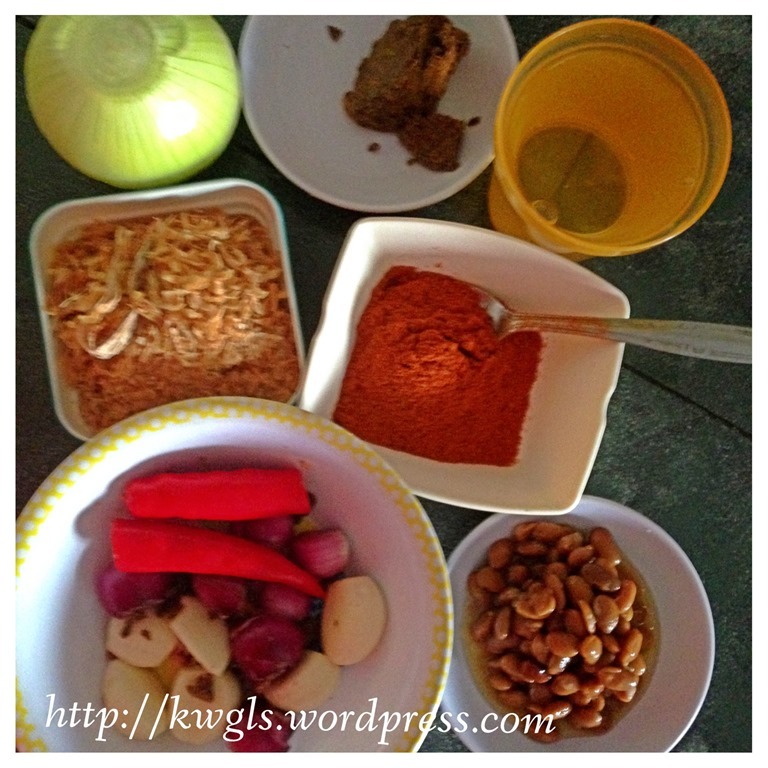 In the same frying pan, use the oil left after dishing out the taukwa, put in the remaining spice mix or rempah. Stir fry until fragrant. Add in the chopped chives. Stir fry for one minute. 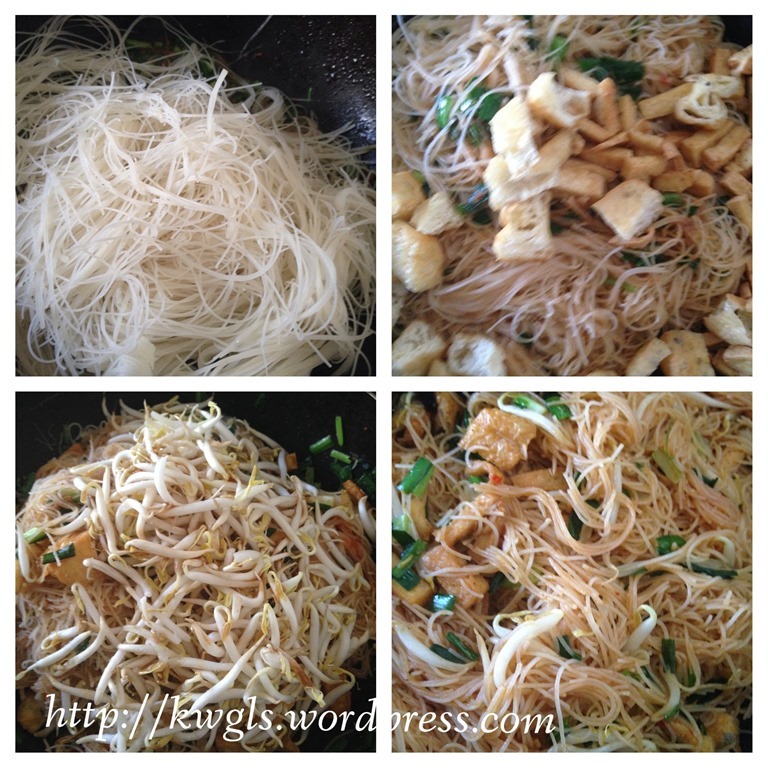 Add the rice vermicelli, diced deep fried bean curd (taupok), stir fry until well mixed. 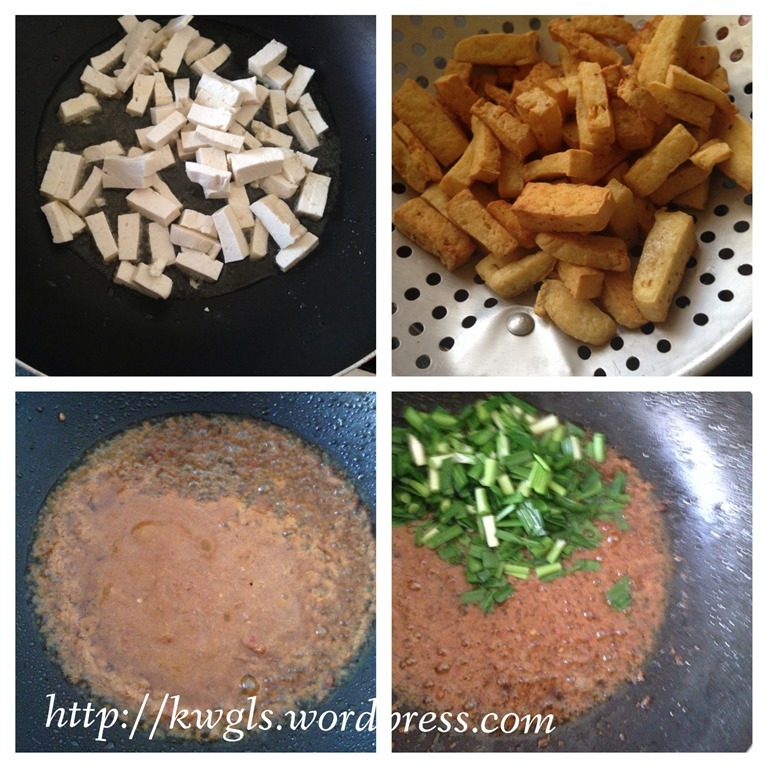 Add in seasonings such as sugar, salt, light soya sauce and followed by beansprout. Stir fry for 1-2 minutes and off the heat. Take some fried rice vermicelli and try if it suits your taste buds. If not, do adjust at this stage. For assembly, in a bowl, have some fried rice vermicelli. Put some gravy on the fried rice vermicelli until it just covered the rice vermicelli. 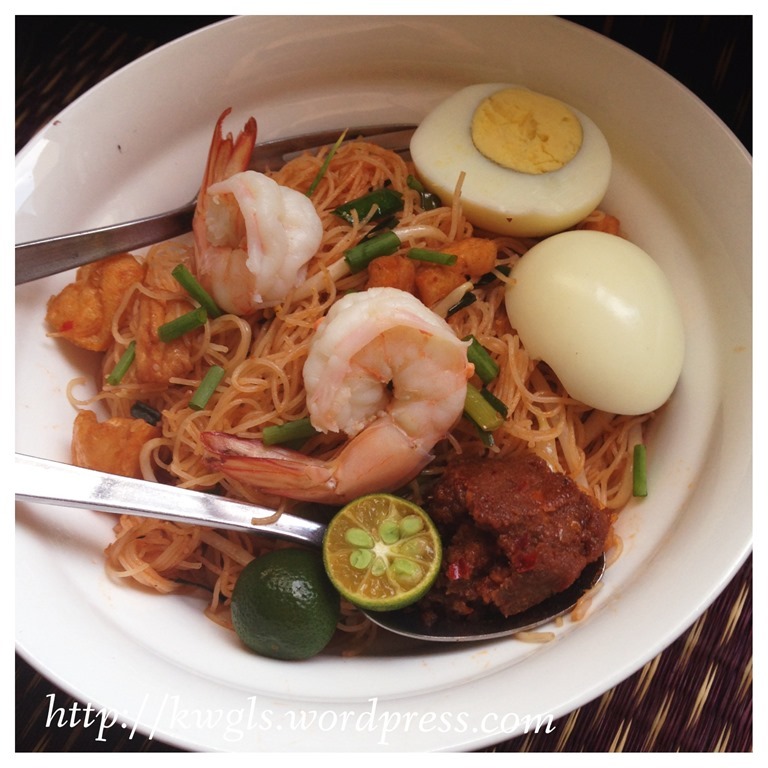 Top the noodle dish with the blanched prawns, hard boiled eggs, cut calamansi, chopped spring onion or chives and sambal. Best served when it is hot as a noodle dish by itself. As this is a savoury noodle dish, variations are many. All quantities stated here are for reference. Please feel free to adjust to suit your taste buds. 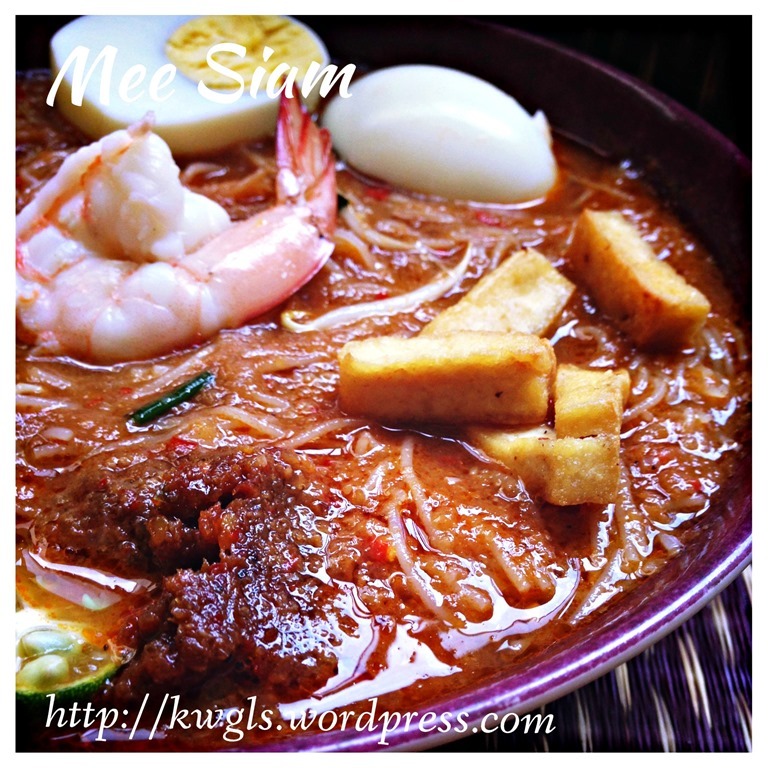 This entry was posted in Food Preparation Series, Noodles, Rice and Others and tagged 8, 米暹， Mee siam basah, GUAI SHU SHU, Guaishushu, kenneth goh, mee siam, postaday. Bookmark the permalink. Kenneth, the big onion the red or yellow one? also, what and how to achieve the orangy color on the bee hoon? Big onion can be either red or yellow. Orangy are mostly because of the chilli. Assam is tamarind is in the recipe. However, I have never added crushed peanuts. Thanks for highlighting.